I had never had a dumpling of any kind with oxtails. I have eaten more than my fair share of dumplings in my day, but never with oxtail. 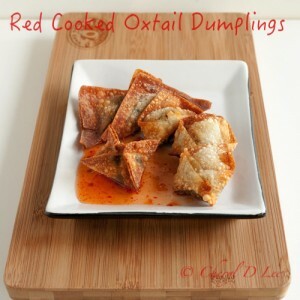 After making these Red Cooked Oxtail Dumplings, one thing I know for sure is that I will eat oxtail dumplings again. After making a large batch of Red Cooked Oxtails, I froze some of the oxtails. Those oxtails were so sweet, sticky and succulent from the long slow braise in red cooking liquid. The meat fell off the bone and barely needed chewing. They were probably the richest oxtails I had ever made. These dumplings are incredibly simple because I used store bought wonton wrappers. You will not need the entire package of wonton wrappers, so be sure to freeze them for future use. Serve them with your favorite dumpling dipping sauce. 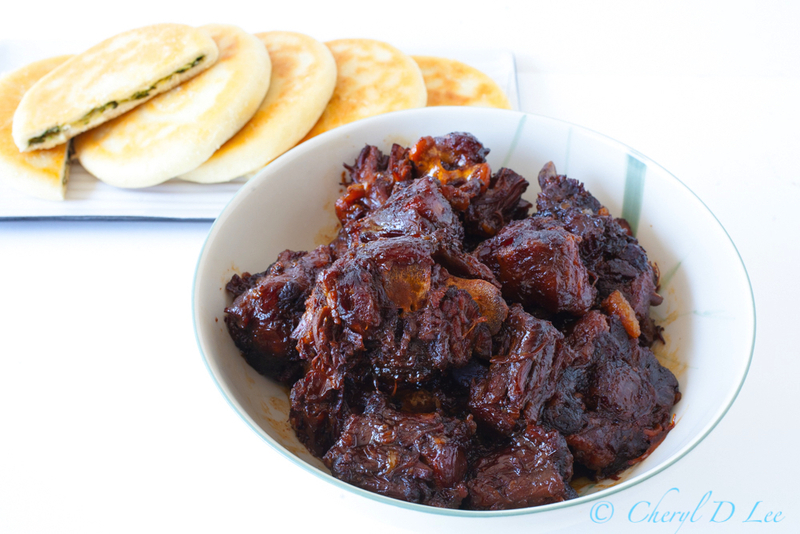 I recommend Sweet Chile Sauce, which balances the richness of the oxtails. Heat the oxtail meat slightly to make it easier to work with. On a a clean, dry surface place a few wonton wrappers. Place about 1 - 2 teaspoons of oxtail onto each wrapper. Brush a small amount of the egg onto the edges of the wrapper. Fold the wrapper in half diagonally, pressing out any air, and sealing the edges well. Repeat with the remaining wrappers and oxtail. 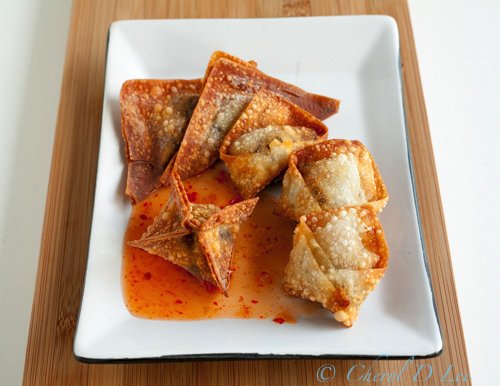 If desired, brush the tips of the triangular dumplings with egg and fold inward to make a pentagonal dumpling. In a small pot, pour enough oil to deep fry the dumplings. Heat the oil to 350° F.
Fry the dumplings in batches until golden brown and crispy, about 4 - 5 minutes. Drain well on paper towels to absorb any excess oil.